Perfect Fit. Only compatible with Fitbit Charge 2 Heart Rate Fitness Wristband. Not for other Fitbit models. Safe and Efficient Charge. Output: 5V, 500mA-1000mA. Support 10000 times of fast and stable charging. Provide short-circuit protection and overload protection that prevent your Fitbit Charge 2 from being damaged by overcurrent. Hassle-free Use. 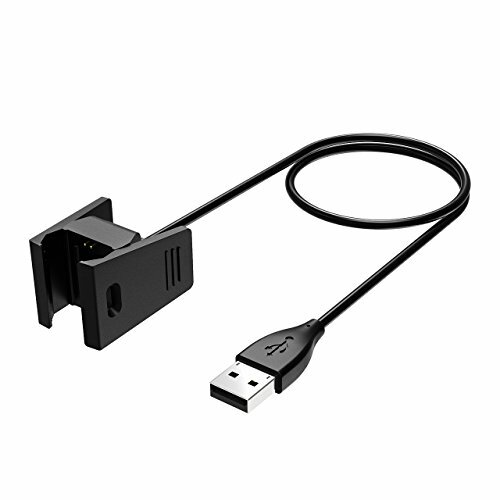 Easily plug it into USB port on your PC, laptop, notebook, wall charger or car charger to charge. The durable clip holds Fitbit Charge 2 securely without getting loose easily. Premium Quality. Adopted eco-friendly TPE and TPU material, the flexible cable ensures tangle-free operation. Sturdy clip and connector allow you to charge with ease. Lightweight and Portable. 22in (55cm) long cable is for your convenient use. Compact and lightweight design makes it easy to store and carry..